PhD program in Physics: This program includes a standard physics core curriculum, with research opportunities in the areas of astrophysics, condensed-matter physics, as well as quantum optics and quantum information science. Detailed information about course listings and program requirements can be found in the UMBC Graduate Catalog. PhD program in Atmospheric Physics: This program includes a specialized curriculum with a focus in atmospheric physics, and research opportunities in the areas of remote sensing, atmospheric modeling, and climate dynamics. Detailed information about course listings and program requirements can be found in the UMBC Graduate Catalog. The Physics Department typically has a total of about 50 graduate students, with roughly 2/3 in the Physics PhD program and 1/3 in the Atmospheric Physics PhD program. Graduate students in the Physics PhD program typically come with undergraduate degrees in physics or engineering, while students in the Atmospheric Physics program typically come with undergraduate degrees in physics, engineering, or atmospheric science. For information on How to Apply to these PhD programs, click here. Note that all of our PhD students earn an MS degree en-route to the PhD. Students specifically interested in a terminal-MS degree should contact the relevant Graduate Program Director for more information. All of our full-time PhD students are fully financially supported through Teaching Assistantships, Research Assistantships, and/or fellowships. These include free tuition, health insurance, and stipends typically ranging from $26K to $31K per year. 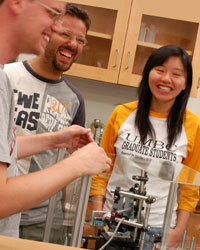 For more information about financial support for our graduate students, click here. The Physics Department is large enough to offer a wealth of research opportunities to PhD students, while being small enough to promote a collegial and inclusive environment. The grad students have created a “work hard, play hard” culture, with seminars and various social events coordinated by the Physics Graduate Student Association (PGSA). Graduates from our PhD programs typically go on to post-docs and other academic positions, research jobs in government labs, as well as high-tech jobs in private industry. For a list of Recent PhD Topics and jobs after UMBC, click here.